Well, we’ve all made it past hump day and we’re only one day away from the weekend. This cocktail is the perfect addition to your weekend, whatever your plans may be. Mr. Homemaker and I were inspired by a recipe we saw in a recent issue of Garden and Gun magazine. They featured a re-engineered bourbon and coke, and while Mr. Homemaker loves bourbon, I just can’t stand the stuff. So after we made the recipe as written for him to try, we came up with the great idea of adapting the recipe to use rum, a more globally accepted beverage in our house. 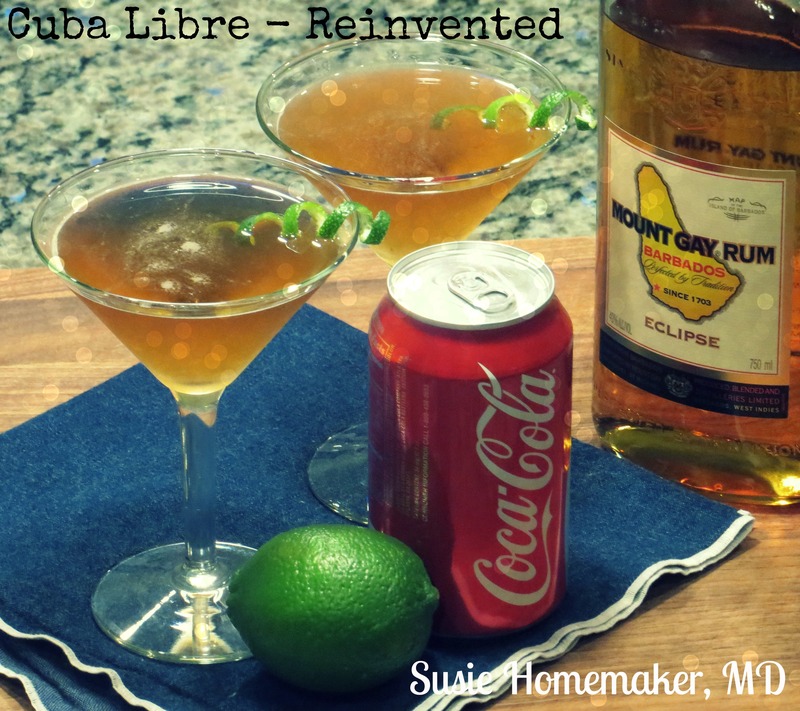 So this “reinvented” recipe is a little different from the original rum and coke (obviously). Traditionally, the beverage is made by combining 1 part rum with 2 parts Coke. The version I am sharing today is the opposite — 3 parts rum to 1 part Coke, making it more suited to sipping like a martini than chugging like a soda. Compared to the Garden and Gun recipe, we like the drink with a little less booze and a little more Coke syrup. We also swapped out the lemon twist for lime to keep up with the typical Cuba Libre gig. The orange-flavored bitters also add to the citrus-y appeal of the drink. We suggest using the best gold rum you can find as the flavor of the liquor is featured. So while making a concentrated syrup from Coca-Cola may seem a little odd to you, go ahead and give it a try. I can assure you it will keep for at least a month in your fridge just in case you decide to use the whole can of Coke to make up a huge batch of Coke Simple Syrup. Heat in a small saucepan over low heat stirring occasionally until all the sugar has completely dissolved. Cool to room temperature and refrigerate until ready to use. One batch makes enough for about 6 cocktails. Combine all ingredients except the garnish in a cocktail shaker full of ice. Shake vigorously then strain into two chilled martini glasses. Enjoy! Inspired by Garden and Gun. ← Grand Summer Ball Ensemble, or Vogue 8849 and a Self-Drafted Skirt!